Have you noticed gas prices recently? If not, that means you either live in a major city where you don’t own or need to own a car…or you live under a rock. Gas prices are HIGH! Seriously people, when you have to drive a lot, filling up your tank hits the budget hard! In light of that lovely fact, I thought I’d write a post about buying a car so you can get better gas mileage. This idea is not new, and it comes up every time gas gets expensive. But what are the costs people don’t consider? Is it really worth trading in your existing car for one that sips the gasoline rather than asking for regular refills? Let’s find out together. Since this is MY post, I’ll use MY vehicle as our example. I’m proud to drive a paid-for 1997 Ford Ranger 3.0L V6 pick-up truck. It’s got 116,000 miles on it and runs great. Last year it was hail damaged pretty badly when we had the mother of all storms come through our area so there are dents all over it. But since the insurance company paid me $1,800 to total it out and keep driving it, I’m okay with those little dents – they look like dollar signs. Other than that, it is in excellent mechanical condition and has no rust or other issues like that. I have no need to get rid of it anytime soon for any reason other than the gas mileage gain I could get from a different vehicle. My little truck gets 20-22 miles per gallon (MPG). To be completely fair in valuing it, I went to the Kelley Blue Book website and discovered my little truck is worth about $2,500 if I were to sell it myself and $1,700 or so if I trade it in at a dealer. So, we have a $2,500 vehicle that gets 22 MPG. Based on our current family needs, if I were to go car shopping right now (even for something nice and used), I’d be looking for something like a 2010 Ford Fusion (mid-size car, a couple of years old so the depreciation wouldn’t eat me alive). Again using Kelley Blue Book as my comparison, that car would run me about $15,000, assuming I paid cash (who am I kidding, of COURSE I’d pay cash or I wouldn’t be buying!). That car gets 24-27 MPG if I’m lucky. So far, the math does NOT make sense (do I even need to do a side-by-side comparison? Let’s keep going. Let’s say I go out and buy the most popular hybrid out there, the Toyota Prius. Again we’ll look at a 2010. With the additional required purchases of granola, tie-dye clothing, a PETA membership and three pairs of Birkenstocks, (my apologies to all Prius owners; I just couldn’t help but crack the small joke) I’d be looking at spending about $28,000. But this time I’m gonna get a rockin’ 50 MPG for my efforts. Is it worth it? Well, to me…NO. With my current pick-up truck and driving habits, and gas prices as they are today, I will spend $2,544 in gas this year (15,000 miles ÷ 22 MPG = 682 gallons needed; $3.73 per gallon x 682 gallons = $2,544). If I buy that Fusion, I’ll spend $2,072 (15,000 miles ÷ 27 MPG = 556 gallons needed; $3.73 per gallon x 556 gallons = $2,074), saving me $470 per year ($2,544 – $2,074). If I buy that Prius, I’ll spend $1,119 (15,000 miles ÷ 50 MPG = 300 gallons needed; $3.73 per gallon x 300 gallons = $1,119), saving me $1,425 per year over my truck. Hmmm…does anyone else see the problem here? As long as you have a car that is paid for, or getting anywhere close to being paid for, buying a vehicle just for the sake of saving on gas makes no sense. Okay, for those of you driving a Hummer H1 that have a 150-mile daily work commute, go ahead and tell me I’m wrong. Otherwise, if your current car runs well and you don’t need to replace it, don’t (unless you’re stepping way down in price point). The same argument goes for buying a motorcycle. I’d love to have another motorcycle, but to shell out $5,000 on a nice bike that gets 60 MPG doesn’t make mathematical sense. Especially when you add in insurance and tax costs, you’re not saving any money. It is a toy that if I can afford, is perfectly okay to buy. But don’t go around telling people you bought your $15,000 Harley so you could save money. When I’m ready to buy my next vehicle, I will definitely consider fuel economy into my decision. I’ll also factor in my available budget! While I’m sure there are going to be some situations where my examples above won’t apply to you, my encouragement is this: if you’re going car shopping, look at your family needs and your budget before you consider fuel mileage. Consider it, but don’t buy something just because of it. I bet the Duggars cringe every time they go to the pump. I’d also bet they have no plans to buy a sub-compact car, no matter how economical it is on fuel. It just doesn’t fit their needs. While you may struggle to pay so much for gas, when you really break it all down I think you’ll find that you really can’t beat the car you’re currently driving for overall economy…and shouldn’t try until that car is ready (needs) to be replaced. *This post is linked at Homestead Barn Hop at The Prairie Homestead, at Works For Me Wednesday on We Are That Family, at Frugal Friday on Life as Mom, at Frugal Days Sustainable Ways at Frugally Sustainable, and at Frugal Tuesday Tip on Living The Frugal Life. We live in a rural area so we drive a lot. A year and a half ago, we bought a brand new Nissan Versa. It’s been a blessing. We only paid $10.5 k for it with taxes and all. We get 35-38 mpg. At the time I compared buying the Versa with a Prius. If gas stayed at a constant $4.00 per gallon and maintenance cost were the same, they’d cost the same only after seven years, at our high rate of miles driven. My husband’s job is 20 miles one way. If gas was $3.50 per gallon and he used the 13 mpg pickup, the car payment (yikes! still about a year left on that!) on the Versa would still be less than the gas difference. I’m sure that you are right in a lot of situations, but not in ours. I would encourage others considering fuel efficiency to look at cars like the Versa in addition to cars like the Prius. I’m glad you’ve found a solution that works for you. The point I really wanted to convey was that you shouldn’t buy a new or another car JUST because of fuel mileage. When I go to purchase my next vehicle, fuel mileage will play a part in my decision, but it won’t be the deciding factor. I also have a long commute (about 25 miles each way currently), but the math doesn’t work for me (or probably 97% of others). I love this post. My husband and I both bought used cars. And while we have small vehicle loans on them (Both will be paid off in the next year), it’s nothing compared to the cost of a new car. But another perk I’d like to point out is the environmental impact. I drive an SUV. It’s so useful for hauling stuff around (including our two dogs). People sometimes say it’s not very environmentally friendly and that I should buy a car with better MPG if I’m really trying to be green. This isn’t true. My SUV, while it only gets about 19 – 25 mpg, will have a smaller carbon footprint than buying a new car because of all the resources and energy that go into manufacturing a new car. Those costs are not offset by even the most fuel efficient models. So not only is buying used, or simply keeping what you have and fixing it, better for your wallet, it’s much better for the environment. Here’s a couple of news article so people don’t think I’m making this up. Jenn, that is an EXCELLENT point! Thanks so much for sharing it here. 🙂 I drive an SUV too. our trucks get terrible mileage(my 1998 ford f150 gets around 18-20 mpg, the 1990 dodge 3/4 ton ram gets a little better, both over 200,000 miles and run great) but if we would factor in the payments(both are paid for), insurance(more than likely we would have to upgrade to full coverage if we had to make payments, not to mention, we have a permit driver, and another in 2 years), taxes, etc it’s just cheaper for us to keep what we have. Hubby has a motorcycle that he bought a little over a year ago(with cash, no payments) for purpose of driving while working(weather permitting around here). Yep. I’ve seen Prius cars…..they aren’t very nice to those who are taller. 🙂 And I won’t tell Barry about your husband’s motorcycle – he used to have one, but we had to sell it. This is something I’m running over in my mind each and every day. My car is paid for and gets gas mileage similar to yours. I drive 40+ miles per day which means I’m currently spending $40 a week to commute. The thing about my car is, it’s breaking down all the time and I’m routinely putting about $600 every few months in to it. Getting something like the Prius V (my fav new drool-worthy car) would save me at least $100 a month in gas. If I assumed that I’m spending $600 every 3-4 months (so about $200 a month) in repairs, a car payment (which I hate) would be whatever minus the $300 ($200 for repairs and $100 for gas). I don’t like car payments, so I guess I’m waiting for this car to die, or for someone rich to rear end me! I like that you’re “waiting for the car to die.” I think that taking the fuel efficiency into account when purchasing a car is more than smart, but buying another car for that point alone isn’t so smart. Thanks Stacy for writing a post that takes the whole picture into account! I actually have a Prius. We bought in when our last car died in 2004. (As in tow it to the junkyard.) 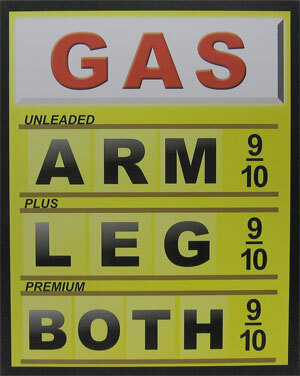 Obviously this was back when gas prices were ‘only’ about $1.50/gal. We’ve heard from a lot of people that the extra cost of a hybrid doesn’t make up for the gas savings, assuming you’re forced into buying a car. However, we made up any extra in less than two years, and that was before gas prices had doubled. It’s true that it isn’t as huge as some vehicles but that is part of the tradeoff. We could fit 5 people in there if we bought different car seats and the trunk is able to fit my Costco purchases as long as I don’t waste space. If we have another child we will have to decide whether we should replace the car or the car seats, but for now it is a very good option. If you have less than 3 kids and don’t live on a ranch it is a good option when a car needs replacing. Maintenance is low and easy and we’ve gotten 45 – 55 mpg since we got it. We’re the opposite. 🙂 Barry’s truck gets better gas mileage than my SUV….but Annie doesn’t have a car seat in the truck. We’ve just had to make a budget adjustment to accommodate for gas. You’re right – the pump hurts, but not as much as a regular car payment…. Great post! I’ve made a similar argument to people about energy efficient appliances. I’m all about saving money and living green, but often times the math doesn’t add up and it is really just a case of consumerism/marketing. The greenest thing to do is usually to make due with what you have. The smartest money move is to NOT spend money. I drive a 2004 Tahoe that will be paid off within a 3 months and was comparing it to a Prius also for gas mileage but couldn’t come out cheaper or comfortable. My vehicle fits ALL of our needs now and when our family grows more. Plus, I can go to Sam’s Club and not fold down seats or cram the stuff in everywhere like I would with a Prius. Thank you for writing this, I hope more people start thinking like you.